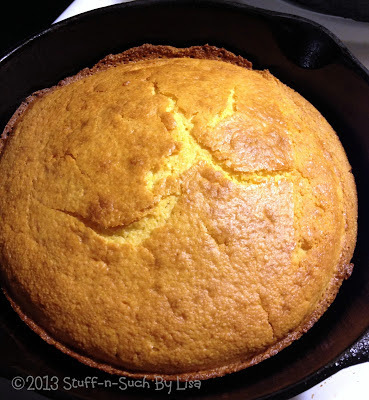 Welcome to day 5 of the Shrimp N' Grits: A Southern Style Blog Hop! From June 17 - 30, bloggers are invited to link up their family-friendly posts about life in the South: recipes, crafts, kids' activities, and more! So grab a big bowl of shrimp n' grits, a tall glass of iced tea, and sit back on your porch swing, because we are getting ready for some down home fun! For those of you who know me...you won't be surprised that I LOVE Southern Style Food, so being a co-host of the Shrimp N' Grits Blog Hop is right up my alley! Even though I wasn't born in the South...my sweet Mama and her parents were, so I had an upbringing rooted deep in those traditions...especially when it came to food. I remember visiting my Grandmother in Tennesee and watching her pick the food right from her Garden and cook it up fresh! The smells in her home were heavenly and the atmosphere so loving and inviting! What I wouldn't give to spend another day with her...she passed away in 2008 leaving a huge hole in my heart, but I am blessed that she was my Grandmother and am thankful for the great memories she left me with. When my Grandmother served a meal, it was not your typical 3 course meal...it was more like everything but the kitchen sink! I swear I don't know how she did it...I have trouble just getting one or two items on the table and her table was always filled to the brim with delicious, mouth-watering food. 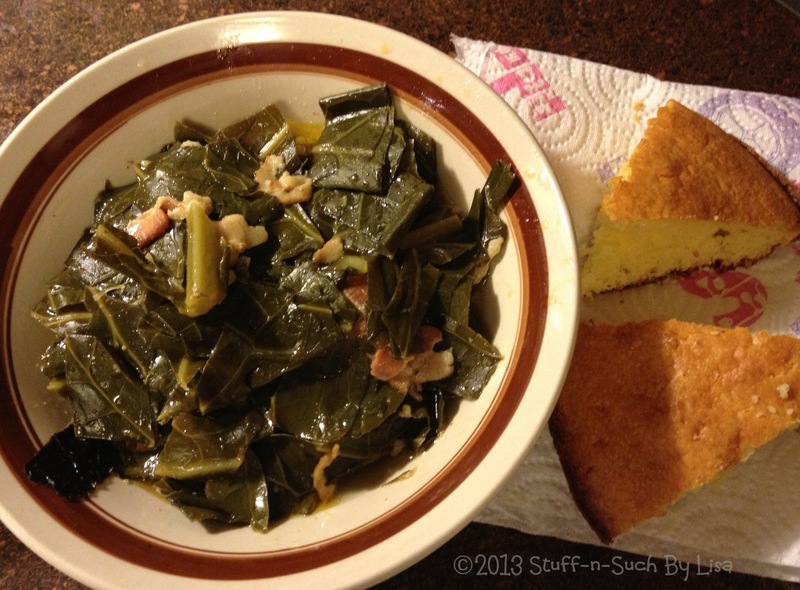 One of my favorite things she made was Greens...turnip greens or collard greens...didn't matter...they both tasted great! I live in California now and "Greens" here means green salad, so it's a bit hard to find greens at the local supermarket. 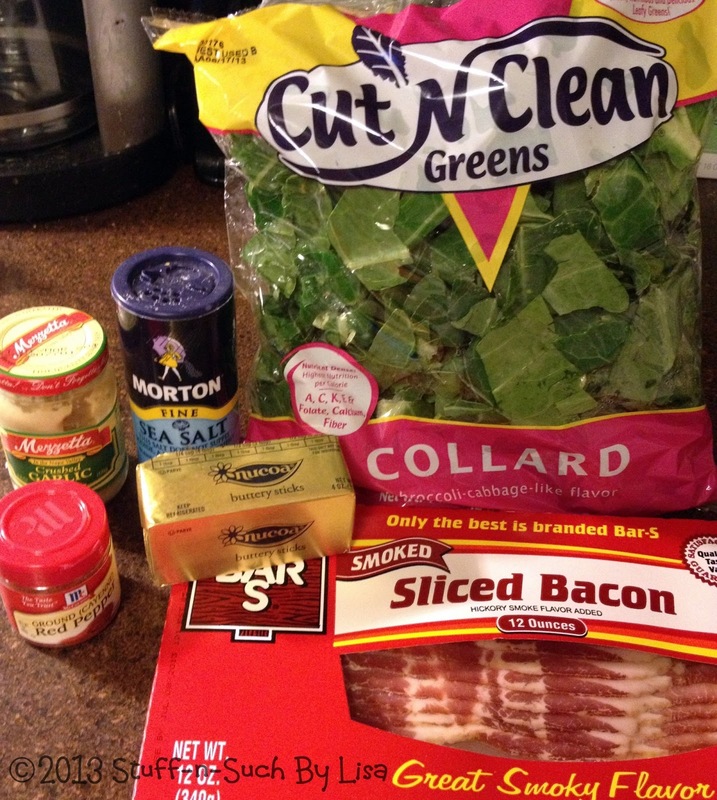 Recently I did find a discount grocer that carries the Cut-n-Clean Bagged Greens and I was pretty excited about that! 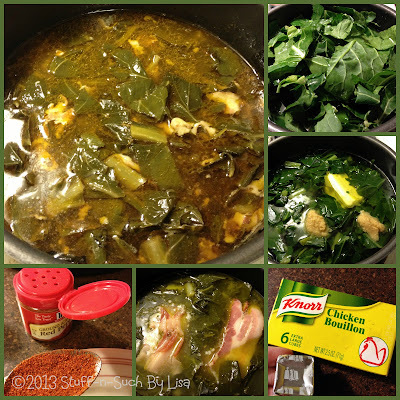 I never did get an official "recipe" from my Grandmother on how to make greens, but I remember she put bacon or ham in them, so I just tried my best to duplicate what I remember her doing. My greens turned out pretty good, though I won't claim them to be as good as hers were! Cover Greens in large cooking pot with water. Bring to a boil, reduce heat to med low. Return to a boil then reduce heat to low. Simmer until tender, usually an hour to an hour and a half. I like to serve them up with a tasty batch of skillet cornbread…another Southern Favorite! I don't think I have to tell ya...but this recipe ain't "low-cal" if ya know what I mean! You can make it lower calorie though...by using Olive Oil instead of butter or margarine and leaving out the bacon. You can also leave out the salt and the bouillon for a low sodium diet...but let's be real here...if you want that true Southern taste...you need all that stuff that ain't no good fer ya! So take that for what it's worth...I'm no doctor and certainly wouldn't recommend eating this way all the time, but golly it sure tastes good to have a little bacon fat every now and then! 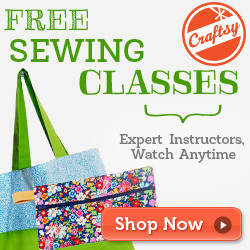 Thanks so much for stopping by and relaxing on the porch awhile! So happy to be co-hosting the Shrimp N' Grits Blog hop! 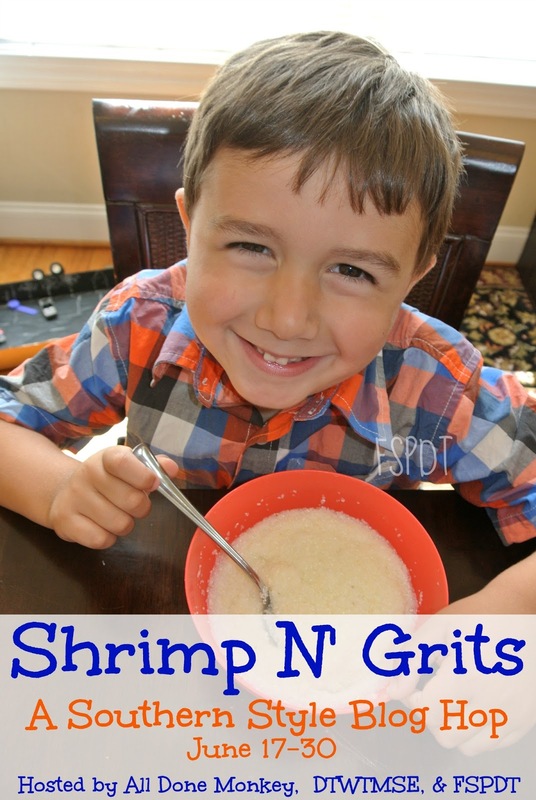 Welcome to the Shrimp N' Grits: A Southern Style Blog Hop! From June 17 - 30, bloggers are invited to link up their family-friendly posts about life in the South: recipes, crafts, kids' activities, and more! So grab a big bowl of shrimp n' grits, a tall glass of iced tea, and sit back on your porch swing, because we are getting ready for some down home fun!